If Rep. Nancy Pelosi (D-Calif.) wants to reclaim the House speaker’s gavel, she might have to make a deal with several moderate Democrats, including Rep. Tom Suozzi (D-Glen Cove). Suozzi and nine other Democrats who are part of the Problem Solvers Caucus — a group of 24 Democrats and 24 Republicans who seek to pass bipartisan legislation in the House of Representatives — promised to withhold their vote until Pelosi agrees to three rule changes that they believe will break the gridlock in Congress. “In this era of divided government, we hope Leader Pelosi will join us in taking these three concrete steps for change to help break the gridlock and pass meaningful legislation to fix health care, immigration, and infrastructure,” the representatives wrote in a statement, according to The Hill. The first proposal would require that any legislation that receives 290 co-sponsors, or three-fifths of the House, should be debated and receive a timely floor vote. The second proposal would have any amendment with at least 20 co-sponsors in each the Republican and Democratic parties would get a debate and a vote. The third proposal would allow every new member in each new Congress to introduce one bill on the committee on which he or she serves that would guarantee debate and a committee vote, as long as the measure is bipartisan and relevant to that committee’s jurisdiction. 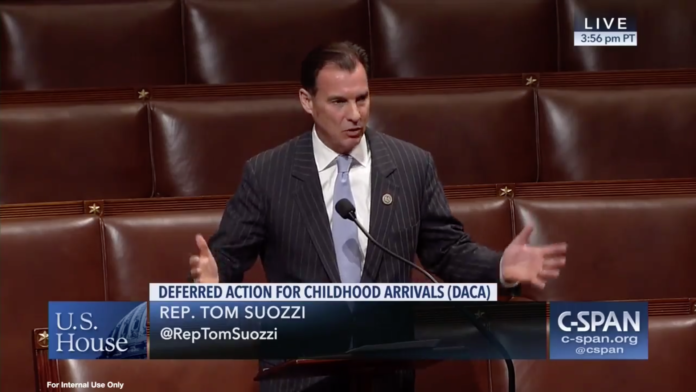 In addition to Suozzi, those supporting the changes are Democratic Reps. Josh Gottheimer (New Jersey), Jim Costa (California), Tom O’Halleran (Arizona), Kurt Schrader (Oregon), Daniel Lipinski (Illinois), Stephanie Murphy (Florida), Vicente González (Texas) and Darren Soto (Florida). Suozzi campaigned on a message of bipartisanship this fall, when he won re-election in the 3rd Congressional District. In an interview with Blank Slate Media last month, he said that the current rules in the House made it difficult for bipartisan legislation to reach a vote because of extreme members of parties, such as the GOP’s Freedom Caucus. The group wrote a letter to Pelosi earlier this month, asking for several rule changes. “We know it is not in the best interest of our nation for the House to operate in the same hyper-partisan manner as it did in the 115th Congress, where extremists prevented common sense, bipartisan proposals on health care, immigration reform, infrastructure, and too many others, from reaching the floor,” the letter read. Pelosi met with the group last week, a meeting that she called “positive and constructive.” But a deal still had not been reached, so Pelosi will meet with the group again this week. Nassau’s other representative, Kathleen Rice (D-Garden City), has called for Pelosi to step down. In an opinion piece earlier this month, Rice praised the House minority leader while calling for new leadership. Rice said during the election that she would not support Pelosi and has endorsed Rep. Tim Ryan (D-Ohio) as a possible replacement.